In this music production article Daniel Salvaggio shares his insight into staying organized and explores several methods to help you develop your music production workflow and finish tracks faster. Organization is often an overlooked aspect of the production process; keen organization skills are an asset when it comes to working quickly and efficiently in the studio. As we’ve mentioned before, the more adept you become at rapidly articulating ideas within your software, the more music you’ll be able to create, and in turn, develop as a more experienced producer. The benefits of being well organized are most apparent within your DAW. Sometimes we get so caught up in exploring our musical ideas that we overlook simple things. For example, labeling our tracks, leaving us with a project containing 40 tracks of ’1 AUDIO,’ ’2 AUDIO,’ ’3 MIDI,’ and so on. I’m a big proponent of ‘don’t break your momentum no matter what.’ While it may seem that stopping to label your tracks is a detraction from that, you’re actually bound to lose more time overall in scouring through your project trying to discern what’s what. The more unlabeled tracks you create, the more the likely you are to encounter this issue. The remedy is simple: Made a new track? Name it right there on the spot! Those couple of seconds spent at that moment may save you several in the long run, and believe me, every second counts! But don’t stop there, use COLOR as well! Just about all DAWs have a way to color code each track, and you should be taking full advantage of that. Long ago I adapted a brutally simple yet highly effective way of doing this and haven’t looked back. All of my synths are a shade of green, drums are purple, vocals are yellow, and samples/misc. audio are red. In doing this, it’s become second nature for my eye (and in turn, my mouse pointer) to immediately go to whatever track it is I need to work on next. That vocal not sitting right and needs to be warped? In a fraction of a second, the culprit is in my crosshairs. In a busy, dense project without this system in place I may find myself demoing multiple tracks in order to find the right one. Make and Label Custom Instruments! As artists, we work tirelessly towards finding and bettering our own unique sound. A big part of that unique sound comes from the tonality of the instruments and sounds we design ourselves. Instead of forgetting about these sounds when it comes time to create a new project, save them and reuse them! Not only will doing so add a sense of continuity to your work, it’ll save you a ton of time during the writing process. Dropping in an instrument you know allows you to keep writing versus stopping your momentum completely in order to design a new sound. Another benefit of reusing a custom instrument is that you know it inside and out. Considering you assigned every parameter yourself, you know what can be manipulated to get the most out of it. Using Ableton Live? Get the most out of your instrument by grouping it (click the instrument and input Ctrl+G), and then assign useful parameters to the instrument rack’s macro section. These parameters may consist of basic properties like Attack, Decay, Sustain, and Release. Through automation, you can control these parameters to breath infinitely more life into your instrument. Having them ready to go upon dropping the instrument into your track is a beautiful thing. Lastly, it should be noted that it’s wise to label these instruments, so you don’t waste time demoing synths to see what’s what. My overall process has changed over the last several years. Over time, I have found it crucially important to explore as many ideas as possible versus trying to polish every minor idea I’d had into a complete song. This approach has been fruitful as there are days where I’ll get upwards of six or seven sketches together that I may later listen back to and see which are worth developing into full songs. However, in doing this, these sketches pile up very quickly, and it’s easy to forget what’s what. Instead of titling all of these potential songs with my artist name and the date, I found it helpful to add some sort of description to the title. Naming these projects to something like ‘F minor guitar arpeggio idea’ or ‘dark downtempo house idea’ may instantaneously remind you of what’s contained within the project upon reading the title. Doing this prevents the need to open all of these projects up individually, which saves a lot of time in the long run. By the time a project is completed, it is common to have many iterations of the song in question. The methodology behind this is to save your project as a new version before making any severe changes in case they don’t work out as intended. Over time, these projects build up and you may wind up with a folder full of a dozen projects you will literally never revisit. Get rid of those! I can already feel the sighs coming. Organizing a sample library is by far every producer’s least favorite pastime, but the benefits of doing so are entirely worth it! Sample library organization is a time investment. Depending on how many samples you have (in my case, a few hundred GB), you may very well spend an entire afternoon sorting sounds. However, you will 100% get that time back in the long run. I took it upon myself to create a custom library of my favorite sounds several years ago, and I am still using this folder as my primary go-to library to this day. In fact, some of my best works can be attributed in part to being able to efficiently browse this library. Ultimately, that one day spent sorting wound up being one of the best things I’ve ever done in the studio. There are many ways to organize a library. I prefer the old school folder method, much like what you’ll find when you purchase a sample pack. 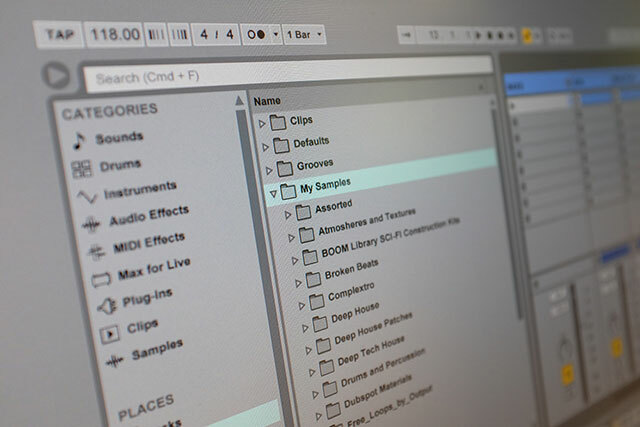 Create several properly labeled folders – kicks, snares, claps, FX, etc. Within these folders, create sub-directories that are a bit more descriptive. For instance, within your snares folder, create folders like ‘big snares,’ ’808 snares,’ ‘trash can snares,’ ‘layered snares,’ ‘live drum snares,’ and so on. When it comes time to populate these folders, be ruthless! Scour through your sample packs and only pick the best of the best. Some sample packs and libraries may contain hundreds of samples you’ll never actually use and by cutting them out of the equation here, we save a lot of valuable production time with regards to demoing samples for use in a project. The name of the game is efficiency. By adopting these methods and incorporating them into your workflow, you’ll see a major boost in productivity. The goal is to always be moving, always creating, finishing projects and starting new ones. Having to demo heaps of samples and instruments only serves to detract from that goal. Stay organized and stay focused!